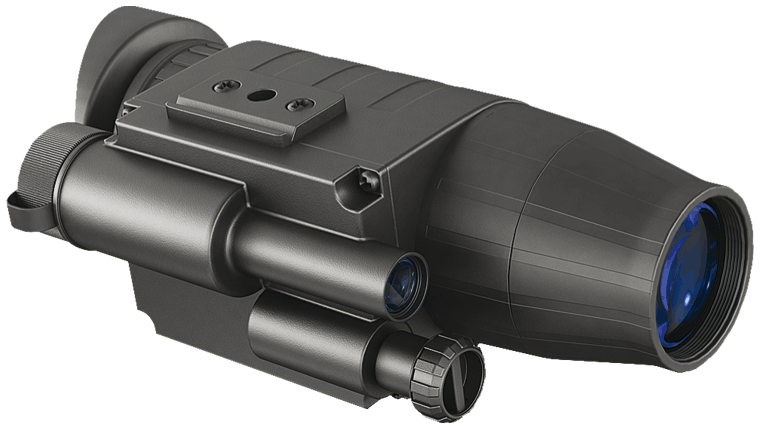 An energy-conserving wide-angled IR illuminator is designed to use the device on a Head Mount in lowlight (for map reading, travelling, use in dark isolated premises). The Challenger G2+ are outfitted with a new five-lens eyepiece that minimizes distortion across the edges of the field of view and increases image sharpness and contrast. A soft rubber eyecup conceals the light emission from the tube thus permitting a user to stay unnoticed. When rotating the eyepiece, the eyecup remains fixed. All operations are carried out with the help of a single switch that sequentially turns on the unit and IR Illuminator. Two diametrically positioned mounting rails with a ¼” tripod mount are used to attach to the Head Mount. Additional Weaver rail on the body is designed to install extra Pulsar IR Illuminator or other accessories. Attention! Black spots can be visible in the field of view of the NV monocular 74094B (Challenger G2+ 1x21B), which is compliant with the technical requirements of the tube EPM223G-11-26V and is not a defect.